Attorney Hayriye Kara: Syrians are not here because Turkey is gracious. They are not here because of our hospitality. “Guests” depend on “hosts.” Refugees are exercising their fundamental rights guaranteed by international law. Syrian refugees’ hardship in Turkey has been made visible by the now-ubiquitous photo of Aylan Kurdi, the little boy who washed ashore in Bodrum. Recently, refugees on their way to cross the land border into Europe were attacked by the police in Edirne, adding to the longstanding calamity that has befallen them as war victims. We all felt sorry for them. We all shed tears for the toddler whose body washed ashore. But is it enough to feel sorry? What do Syrian refugees go through in Turkey? Have they acquired a legal status since their arrival? Why have they been called “guests” and not “refugees?” Most importantly, if they are, in fact, our guests, why are they running away from us? We asked these questions to Attorney Hayriye Kara who has worked extensively with refugees. What is the difference between a refugee and a migrant? What does this distinction mean in the case of Syrian war victims? The definition of “refugee” originates in the 1951 Geneva Convention. According to the Convention, a refugee is someone who has fled his or her country for fear of violence due to his or her race, religion, nationality, or other social affiliation, who cannot or does not want to be protected by that country, and (if she or he does not have a nationality) who does not want to go back to his or her original country of residence due to violence. The Convention cites five reasons to flee one’s country: anyone who cannot resort to the protection of his or her country of citizenship, has been treated inhumanely or is subject to inhumane treatment because of one of these five reasons, is called a refugee. Migrant, on the other hand, is a person who immigrates in the hopes of accessing better life standards – that is, who emigrated for economic reasons. “Refugee” is an internationally defined category referring to movement due to one of the five cited kinds of threats to safety, whereas “migrant” defines all people who move domestically and internationally. That’s up for debate. What I just tried to provide are the legal definitions of these terms, but often, economic concerns are critical vital concerns as well. But legally speaking, refugees are those who have to leave their countries due to their identities and, specifically, the reasons cited in the Convention. The recent picture of a toddler washing ashore in Bodrum contributed to the emergence of a sympathetic public opinion. Similar events happening in Edirne have become public. We discuss the refugees’ desire to leave for Europe but not the reasons why they don’t or can’t stay here. Why do they want to leave? What is it that makes them want to leave enough to risk their lives? Turkey is a bordering country. The mass movement started back in 2011, not just now. Deaths and bodies washing ashore have been routine occurrences for a while. That sad picture [of Aylan Kurdi] has now helped form a public opinion. We understand now that Syrians are not here as tourists, that they came here out of necessity. But I think that the dominant public opinion revolves around a romanticized understanding of victims and not around the violation of their rights. The fact that people in Turkey now react is important, but we need to bring the public opinion back to the basis of rights. Syrians and other refugees are not here because Turkey is gracious. They’re not here because of our hospitality. They are exercising their fundamental rights guaranteed by international law. Turkey is not doing them a favor. Refuge is a fundamental human right. This is the direction that we need to give to the public opinion. According to the numbers given by the Directorate General of Migration Management, there are approximately 1.7 million registered Syrian refugees currently in Turkey. The number is estimated to be above 2 million when the unregistered ones are taken into account. There are also about 237 thousand asylum seekers from other countries waiting to be relocated to a third country. These numbers are severe. Of course, these numbers translate into social and economic liabilities, which shouldn’t be the burden of only the bordering countries. The economic and social burden needs to be shared internationally. But putting that aside for a minute, when the first waves of Syrians started coming into Turkey, their legal status was not recognized. They were called “guests.” There is no such thing in law as guest. Is the “guest” terminology used to avoid our responsibilities? It’s a way not to recognize them legally. Guests depend on their hosts. Calling Syrians guests is denouncing their internationally recognized rights. The rhetoric of guests was later abandoned. Briefly, there was mention of temporary protection even though no such status was backed by any regulation. With the Foreigners and International Protection Act that passed in 2014, temporary protection was introduced. The Act was followed by a code. The new code regulates rights and responsibilities but it hasn’t been implemented well. The right to work is the most problematic area. Refugees can theoretically apply for the right to work, but in practice, it is impossible. “Temporary protection” is issued provisionally in cases of emergencies when mass migration occurs, for instance, due to civil war. Temporary protection is not as comprehensive as international protection. It has set start and end dates. It stipulates that people will return to their countries of citizenship after the conflict ends. Rights guaranteed by “international protection” cannot be acquired with temporary protection. Temporary protection only addresses transitional situations. The concept of temporary protection should not obstruct the issuance of international protection. The provision of these things is the [Turkish] government’s responsibility as defined by international law. The right to shelter is not functioning properly. They have to work without papers. According to regulations, Syrians should be able to enroll in the healthcare system, but in practice they have trouble accessing the system. Many people are mistreated, cannot communicate well because of the language barrier, and do not have access to translators. There is no documentation for people’s personal needs. Because there is no documentation, people in need cannot be identified. The entire system consists of shots in the dark. Syrians work for very low wages and pay abnormally high rents, are subjected to hate speech and discrimination in the street, and can’t access fundamental services. Evidently, they can’t see a future for themselves in Turkey. How can there be a temporary protection that lasts for four years? It’s unclear what’s next for them. As far as we know, the government has no social policy either. It is said that the conflict will last about 10 more years. This means that we will all live together at least for 10 more years. People can’t be sent back to a conflict zone. It is the government’s responsibility to regulate the rights to essential services, to build the practice of living together for all of us, and improve Syrians’ life standards. According to current regulations, Syrians can’t become citizens or apply for international protection. Turkey does not offer Syrian refugees anything. Of course, that makes them want to leave for Europe. Syrian refugees are not a homogeneous group. What is the experience of gay and trans refugees like? Syrian refugees include Christians, Alevis, Sunnis, and Kurds. These groups experience many layers of discrimination. For instance, the Sunnis received religion-based assistance from the Turkish government, which Alevis and Christians couldn’t. But these social groups either came from Syria together or found each other here in Turkey. LGBTs never had that opportunity. Syrian LGBTs who reached and were assisted by Kaos GL have a certain economic standing, speak English, and have access to the Internet. The real problem is with LGBT refugees who work without papers and don’t have Internet access. Nothing is known about those people. And speaking of personal needs, sexual orientation and identity were not covered in the new code. Even for civil society organizations, sexual orientation and identity are afterthoughts. Every Syrian is assumed to be heterosexual. The LGBT refugees that I’m in touch with are not very keen on being with other Syrians. They experience oppression and aggression from both Turkish and Syrian societies. Different forms of discrimination are not experienced in clear-cut ways. When they intersect, problems become multilayered. Gay and trans refugees are targets of both racism and homophobia. 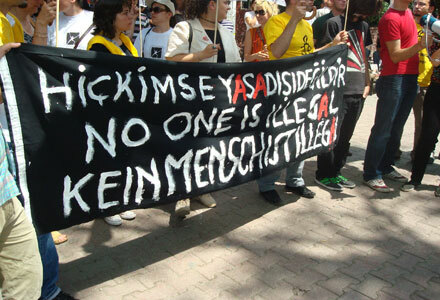 Even when they enter Turkey from the land border, many gay and trans Syrian refugees come to Istanbul and Izmir. Loneliness becomes routine when they can’t find more people like themselves. On the other hand, for instance LGBT refugees from Iran are very organized. We can speak of an Iranian LGBT movement with its own alternative support and communications network. There’s no such network for Syrians. 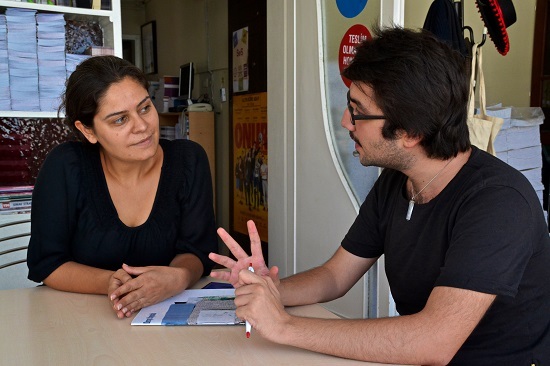 Recently, Syrian LGBTs in Istanbul started organizing with the help of Lambdaistanbul. This sort of initiative is very important to alleviate problems, however slightly. Another problem has to do with the camps. Civil society representatives are not allowed to enter camps administered by AFAD (the Prime Ministry, Disaster and Emergency Management Authority). Serious allegations of code violation, harassment, and human trafficking go uninvestigated. The camps in Suruç, on the other hand, are supported by the municipality and the public in general, so the civil society is present there. Organized by the Istanbul LGBTI Solidarity Association, 6th Trans Pride Week continues. As part of the various panels and workshops taking place during the week, a discussion on trans refugees was held. Problems of trans refugees seeking shelter and various solutions to their problems including the trans guesthouse were presented. The panel, held at the İsmail Beşikçi Foundation, was moderated by Deniz Tunç. 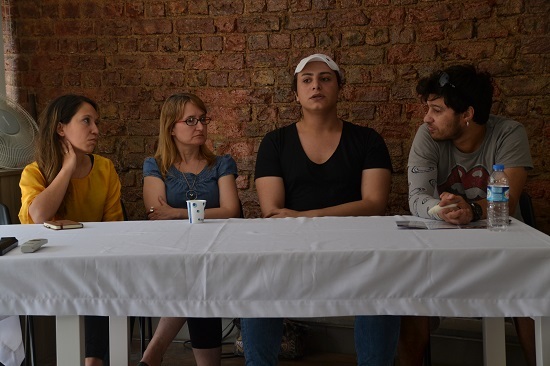 The speakers were Mişa, a trans refugee woman and occupant of the trans guesthouse; Zeynep Kıvılcım of the Istanbul University Political Sciences Faculty, Cansu Alözkan of the Refugees and Immigrants Solidarity Association and Selin Berghan of the Pink Life Association. In her opening speech, Deniz Tunç provided updates on the Trans Guesthouse. According to Tunç, the trans guesthouse provided shelter to almost 50 people. “We have hosted as many as 20 LGBTI refugees from war and we will continue to accommodate them as long as our resources allow us. It is, however, time to stand in solidarity with the guesthouse.” Tunç continued. First panelist Mişa, a Syrian trans refugee woman, talked about the hardships of being an asylum seeker and what she went through in Istanbul.